The Hot Glass Art Center in Marlborough, NH is for anyone who has a passion for glass art and arts education: students... teachers... renters... artists. Hot glass is a traditional medium that celebrates all that is right in our society: Collaboration, trust, teamwork, timing, creativity, and community. We support arts education as a means to bring people together. At the Hot Glass Art Center our mission to create a teaching and learning space focused on hot glass outside the traditional system for Arts Education. Glassblowing is a true team endeavor. There is a scene and a sense of happening when around hot glass. The facility is already a community arts center for people interested in art, glass or being part of something greater than themselves. We offer classes, workshops and rentals available for all levels of glass enthusiasts. Schedule your hot glass experience today. 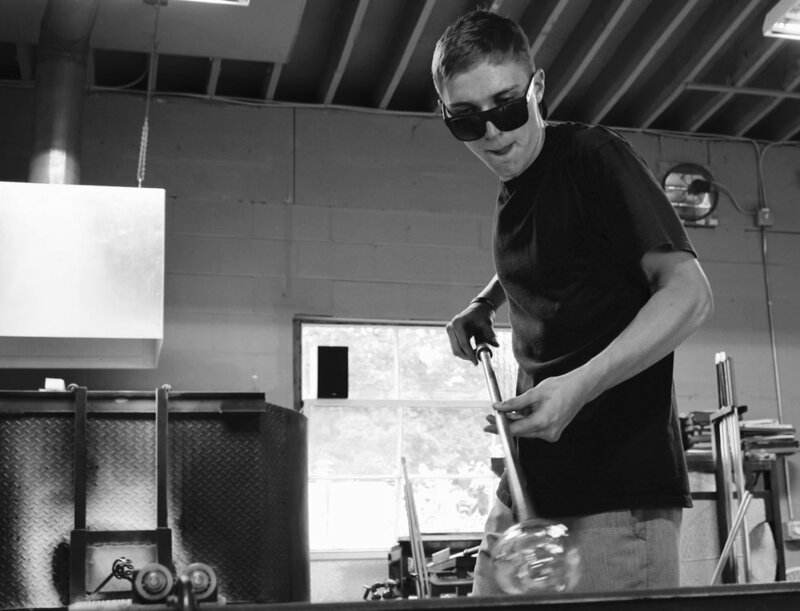 Our diverse team offers a well-rounded experience for the beginner and the accomplished glass blower. Our crew expands beyond the people who are teaching and producing work on a regular basis. Our guest teachers, renters and artists complete the bigger picture of why we are well rounded as a facility in hot glass. Our students also complete our team, without them we’d have a lot less fun in the shop. Together we've created a scene worth celebrating…. Jordana has been an educator in hot glass since 1992. She currently teaches at the HGAC and the Corning Museum of Glass. Jordana ran the glassblowing program at and Franklin Pierce University for over two decades and taught at Snow Farm, The New England Craft Program, for over 24 years. Now, Jordana celebrates the love of learning and teaching in a non-academic setting outside the traditional means of glass education. As a glass maker, Jordana is a juried member of the NH League of Craftsman and shows her work in dozens of galleries and shops including the Museum of Glass in Corning. Jordana works with architectural lighting and design firms, including The Rockwell Group, where she creates and recreates custom blown glass designs for hotels, restaurants and private collections. After completing a the Masters of Fine Arts in Interdisciplinary Art from Goddard College, Jordana articulated that not only is glass her medium of choice but education and hands on learning is also her focus as an artistic and creative medium. As a glassmaker and educator Jordana’s experience and well rounded approach to blowing glass lends to a comfortable, professional and inspiring hot glass experience for those with whom she works. 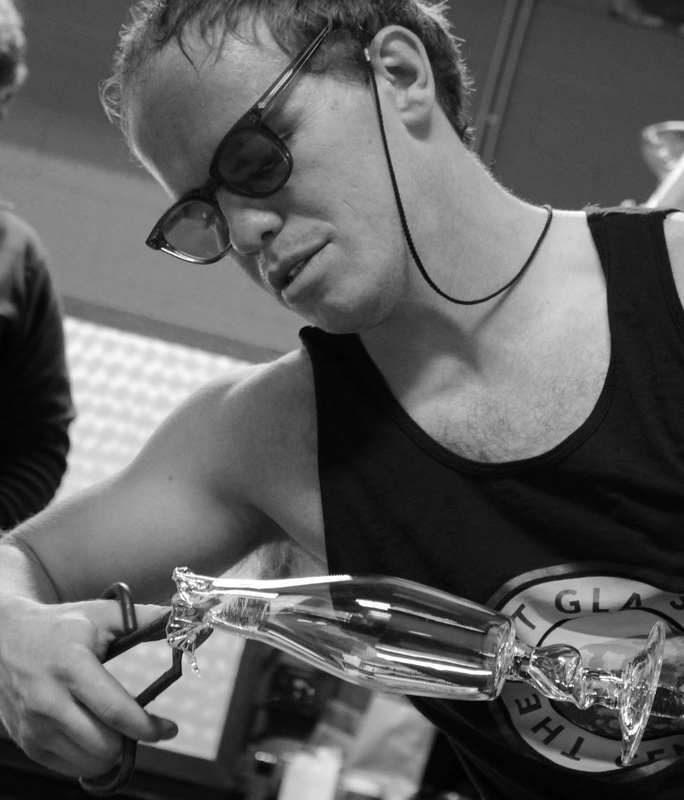 Nate has a style and commitment to skill building in glass which is inspiring. Nate teaches our beginner students and assists in some production pieces. As the studio manager Nate keeps the business end of the shop running smoothly. Jeff is no nonsense glassmaker with a respect for the technical and well made object. Simplicity describes Jeffs asthetic in glass. His glass production experience and leadership shines when it the hotshop. Joey takes on all that the shop presents with ownership, caring and ease. His experience on the torch has made his transition to the furnace seamless. Joey has a degree in Scientific Glass Technology from Salem Community College. Joey teaches our beginner students and assists in some production pieces. The excitement Leah Prevost brings to the studio is refreshing and contagious. She has a love for life and a commitment to learning. Leah has a degree in Scientific Glass Technology from Salem Community College. Leah teaches our beginner students and assists in some production pieces.